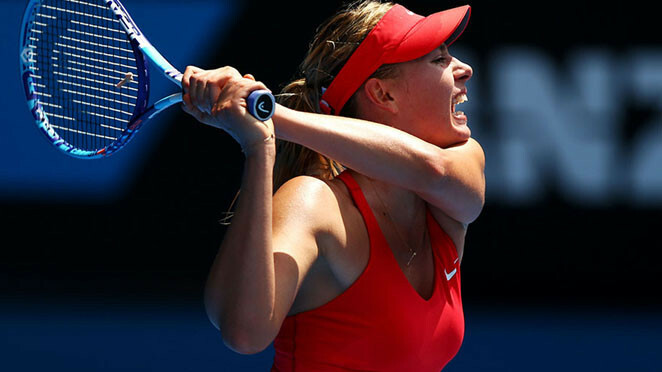 Second seed Maria Sharapova saved match point twice before defeating Alexandra Panova – ranked No.150 in the world – to progress to the third round of the Australian Open. Trailing 5-4 in the decisive third set, Sharapova hit two forehand winners as Panova served for the match, before running out a 6-1 4-6 7-5 winner. “I was not playing my best tennis today,” admitted Sharapova, who hit 51 unforced errors in the match which lasted two hours and 32 minutes. Sharapova, who won the Australian Open in 2008 and has five Grand Slam titles to her name, is the only surviving major winner in her half of the draw. She admitted that she knew “not too much, actually” going into the match about her opponent, who had won her first ever Grand Slam match in five attempts to reach the second round in Melbourne. Sharapova will now face Zarina Diyas of Kazakhstan after the No.31 seed survived a battle of her own, winning 8-6 in the third set against Anna Schmiedlova. Elsewhere in the women’s singles in the afternoon session, there were victories for 10th seed Ekaterina Makarova – 6-4 6-2 against Italian Roberta Vinci – and former French Open finalist Sara Errani, who defeated Silvia Soler-Espinosa 7-6 (3) 6-3. Meanwhile, doubles play began on Wednesday without Serena and Venus Williams. Tournament officials did not immediately specify a reason as to why the American sisters had withdrawn from the competition, though they each face singles matches on Thursday. In the evening match, third-seed Simona Halep eased past Australian Jarmila Gajdosova 6-2 6-2.